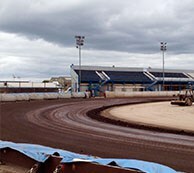 King’s Lynn Speedway is proud to offer a number of commercial opportunities for local and national business to get involved. Speedway racing at King’s Lynn is an intense, exciting and dramatic two hours of top class racing raced out in front the thousands of enthusiastic fans in attendance. 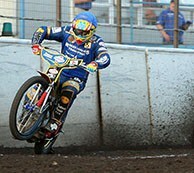 The King’s Lynn Stars race in the sports highest division in the UK, the SGB Premiership. With speedway’s biggest stars on show, the Premiership is broadcast all over the world. Here in the UK, satellite broadcaster BT Sport show live action every week throughout the season. King’s Lynn Speedway have several types of sponsorship and advertising available; these include air barrier banners, heat sponsorship and meeting programme advertising where your company name can be viewed by thousands of people per week. To find out how a partnership with King’s Lynn Speedway could work for your business, please contact our Commercial department using the details below. Around the bends of the famous Adrian Flux Arena race track is a highly viewable advertising space that your business can take advantage of. The air fence is featured heavily on Sky Sports as they follow the action as well as in 95% of all photos taken for local and national media. Advertising on the straights of the Adrian Flux Arena track has huge benefits. Your business will receive worldwide exposure from prime advertising space. The Adrian Flux Arena houses three grandstands, which are all occupied during meetings. Advertising on here will give you valuable exposure on race nights. 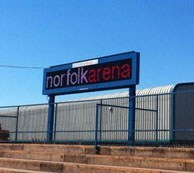 Located in the middle of the first and second bend, the full colour LED scoreboard offers a fantastic way to advertise your business. During the meeting the scoreboard is used to display race details and times. In between races the scoreboard is used to display our commercial partners. Being a team partner of King’s Lynn Speedway has great benefits, Your business will be associated with either the Stars or Young Stars throughout the season and as a club partner your logo will proudly be displayed on our website. 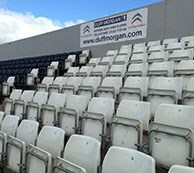 For this season we are giving one business the chance to sponsor each of the seven pit bays. Your company name will be displayed above each riders bay throughout the whole season. Why not take the opportunity to advertise in the Stars Race Day Programme. This means that your advert will be seen by over 70% fans and corporate guests at every home fixture. 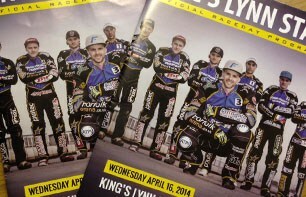 If required King’s Lynn Speedway can also support with the design of your advert. Advertise from as little as £100 get your business valuable exposure this season. With a new website launched for the 2016 season a whole new, innovative world of online advertising exists with the King’s Lynn Stars. Currently over 40,000 unique users every month visit our official site. We are happy to sit down with you and our digital partners to come up with advertising that meets your needs.